Michael Chapman began his career on the Cornish folk circuit in 1967. Signed to the Harvest label, home to Pink Floyd and Deep Purple, he recorded four quasi-legendary albums. The influential 'Fully Qualified Survivor' was John Peel's favorite record of 1970, and featured future Bowie collaborator Mick Ronson. After decades of recording and touring, Chapman remained an obscure figure in the States until his profile was raised by a lengthy 2009 interview with big fan Thurston Moore in Fretboard Journal. He toured extensively with the late guitarist Jack Rose, and more recently, with Bill Callahan. Seattle-based indie label Light in the Attic began a reissue campaign of his Harvest work, and Tompkins Square released the internationally acclaimed double disc, 'Trainsong : Guitar Compositions, 1967-2010'. 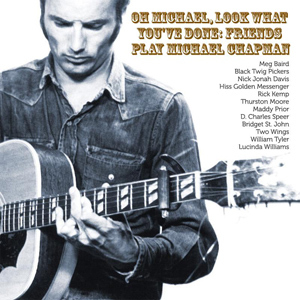 'Oh Michael, Look What You've Done : Friends Play Michael Chapman', compiled by Michael's wife Andru and Tompkins Square's Josh Rosenthal, features artists who have shared a stage with Michael, or share a personal connection. These include some of his contemporaries like Bridget St. John, Maddy Prior, and longtime cohort Rick Kemp (Steeleye Span), as well as young guns inspired by Michael's legacy.